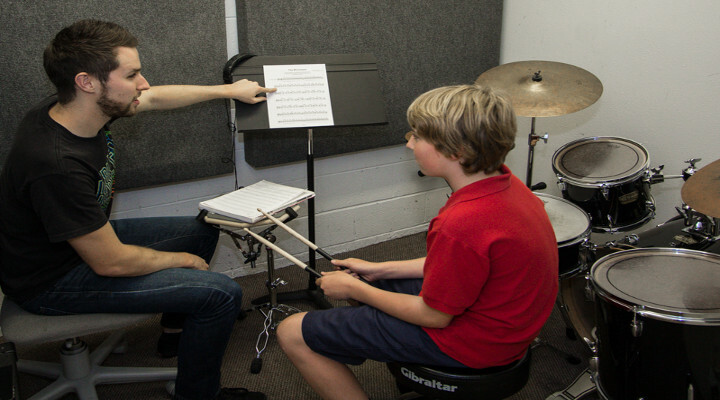 Drum Programs at Music Maker are offered for students from 5 years old to adults. Young beginners (5 to 6) are evaluated for readiness. Students will learn multiple styles including: from Rudimental Drumming to Classical, from Rock and Jazz, to Latin drum set styles. Lessons will focus on musical literacy, technique, music theory (rhythm, scales, and chords), as well as developing a vocabulary for basic and advanced drumming rudiments, ensemble and solo performance, and applying popular music to percussion. Drum classes at Music Maker are enhanced by the multiple performing opportunities to showcase a solo performance in a recital or jam with other musicians, including a rock band.